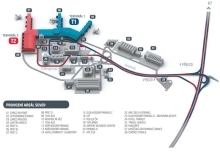 A Litomyšl staff member will arrive at the airport to meet everyone at the marked meeting point on the map of the airport in Terminal 2 at 3:00 p.m. (15:00) to ensure that everyone who will be taking the bus is present before departure. S/he will be holding a sign with "Litomyšl" written upon it (for the meeting place, click to enlarge the map at the bottom of the page). If your plane touches down close to 3 p.m., please proceed to the meeting point immediately; the bus will wait for you until you have cleared passport control, customs and get your luggage. If your flight’s arrival is delayed for more than one hour the bus will have to depart out of consideration for other arriving students, who have been waiting and/or had a long flight to Prague. Please see “If Your Flight is Delayed and you Miss the Bus” instructions below. Student with arrivals scheduled after 3 p.m. must make their own travel arrangements to Litomyšl. If your flight arrives early, go to the EU Cafe (marked on the map), which opens at 6:00 am to wait for the bus. You can get coffee, food and refreshments there while you wait. If Your Flight is Delayed and You Miss the Bus or if Your Flight Plans Do Not Coincide with the Bus Departures. Flight cancellations and delays are not an infrequent occurrence these days, so the bus will wait for delayed flights which land no more than an hour after 3:00 p.m. (15:00) If your delayed flight lands no later than 4 p.m. (16:00) the bus will wait for you long enough for you to clear passport control, customs and get your luggage. Here is some helpful information so you know what to do in case you arrive too late to catch the bus to Litomyšl on Sunday. If your scheduled flight arrival is after 3:00 p.m. (15:00), you can either follow the instructions below on how to take the train to Litomyšl, or you can take a car. Some students typically arrive in the late afternoon or early evening, and once the staff has everyone's travel plans, we can book a taxi which 3-4 people can share. A car to Litomysl is approx. 5,000 Kc, so chances are that you will end up paying 1,000 - 1,500 Kc for the trip if you prefer this option. First, call the master class office to let them know about your delay when you arrive at Václav Havel Airport Prague. Second, take a train from Prague Main Train Station (Hlavní Nádraží) to Česká Třebová. Express Bus: To get to the Main Train Station, take the express bus from the airport (the first one runs at 4:40 a.m., the last one at 9:10 p.m.). The fare is 50 Kč. Taxi: Alternatively, go to the Main Train Station with an authorized taxi, which has a fixed price to downtown Prague. Contact counters of taxi and car operators are located at the arrivals hall of Terminal 1 and 2. Departure points are displayed in front of arrivals halls. AAA and other companies have an exclusive contract with Prague airport to have a fleet of taxis waiting, and guarantees that you will get to your destination at regulation prices, which range from 325 Kc to 530 Kc depending on traffic, but under any circumstances may not exceed 550 Kc. Speak to the taxi supervisor representative inside the arrivals area and tell them you’re going to the Main Train Station. The representative will give you a ticket with the details and 20% off the return trip. Do not use unauthorized taxis, as you will most likely be charged a far higher fare. Train: When you get to the Main Train Station, buy a ticket to Česká Třebová, which is about 250 Kč for a one-way 2nd class ticket. Trains run frequently, but an EC train is recommended, because it cuts travel time from 2:12 hours to 1:40 hours. The timetables from Prague Main Train Station are on this webpage, so you can print out train departures from Prague to Česká Třebová between 3 p.m. until 9 p.m. (arriving no later than 11 p.m.). In the From window enter “Praha” and in the To enter “Česká Třebová. “ Once you purchase your ticket and know your train number and departure time, call the master class staff and ask them to call a taxi for you to take you to Litomyšl since it is doubtful anyone will speak any English in Česká Třebová. Furthermore, a taxi may not be waiting at the train station on a Sunday evening. It's about a 15 minute drive to Litomyšl, and will cost about 400 Kč. Picking up a taxi without a reservation will most likely result in a substantially higher fare. Third, you can also hire a car to take you from the airport to Litomyšl. Taxi: Master Class staff can arrange for a car to Litomyšl for you upon request. Also, you can call Bohemia Prague Airport Transfers, at (+420) 773 066 880 (the same number can be used to send a SMS message). There is English-speaking staff at this number. The cost for the trip will be around 4,500 Kč based on a recent inquiry. Make sure to have them confirm the price when you reserve the car. There may be a 1-2 hour waiting time for the car to arrive, so SMS the company right away when your plane touches down if you know you’ve missed the bus and want to take a car. The trip takes about 2 ½ hours. Fourth, in the very worst case scenario go to a hotel and arrive the next day.